MORE GOOD NEWS FROM ROBOT TOWERS! Smoke Eaters by Sean Grigsby has been setting the book world alight (heh), described as “an exciting story that breathes new life into the urban fantasy genre” in a Publishers Weekly starred review and “a treat” by Jason M. Hough, as well as gaining a whole batch of other lovely words from various lovely people. Deep space penal colony Oubliette, population: scum. Lena “Horror” Horowitz leads the Daughters of Forgotten Light, one of three vicious gangs fighting for survival on Oubliette. The gangs’ fragile truce is shaken when a new shipment arrives from Earth carrying a fresh batch of prisoners and supplies to squabble over. But the delivery includes two new surprises: a drone, and a baby. Earth Senator Linda Dolfuse wants evidence of the bloodthirsty gangs to justify the government finally eradicating the wasters dumped on the colony. There’s only one problem: the baby in the drone’s video may be hers. We’re super excited to be bringing such an interesting concept to fans and can’t wait to get this baby out into the world! 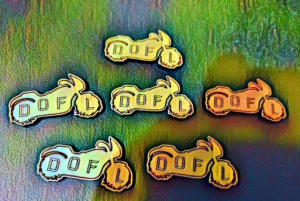 As is Sean it seems, as he’s already created some swag to promote #DOFL. Shiny! 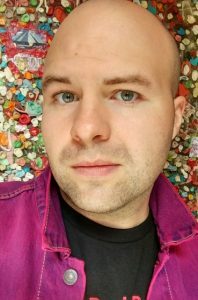 The second novel from Sean is the SEQUEL to Smoke Eaters, named… wait for it… ASH KICKERS. A title that good hasn’t been seen since Adam Rakunas’ joyously named Like A Boss and we are delighted by it. Elite dragon-fighting taskforce, the Smoke Eaters, have been relegated to a paint-by-numbers job tranquilizing the savage reptiles and locking them away in containment zones. It’s not the exciting life that Smoke Eater recruit, Tamerica Williams, was hoping for. But everything changes when a legendary bird of fire – the Phoenix – rises from the earth and starts incinerating everything, driving the remaining dragons into a frenzy, and inspiring a cult of arsonists. Even worse, if you kill the Phoenix, the damned thing just comes back stronger. 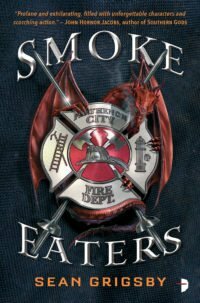 It’s up to Tamerica and her fellow Smoke Eaters to kick some serious ash. They both sound great, don’t they? Well, there’s not too long to wait for either of them! More details, cover reveals and sneak chapter previews soon!